so from now on i m probably will ask for verified all gear i m buy,,its really pissed me..
Verify as soon as possible is what I’ll do from now. Edited by LittleBurger, 11 February 2019 - 10:28 PM. In my case would be more critical, I use a single account as bank account, since i have over 12 accounts. So its easy to just gear whatever char instead gathering gears from all accounts. Since the dupe thing, im being verify all the bough items I made wich pass over 500m, its the only way to be sure you are buying a legit item. But I would like to know if there is some option for special cases like "Please verify all the items in X account". The only items I know are totally legit are the items I personally got from OCP/Verified already. Time lets them working to verified all my gear from pass 10 year around to..
Edited by DarkOrinus, 14 February 2019 - 02:04 AM. This dude got both of his armor and card verified and they ended up removing it without compensation. His thread was quick to be locked for obvious reason. Steer clear of this game folks. 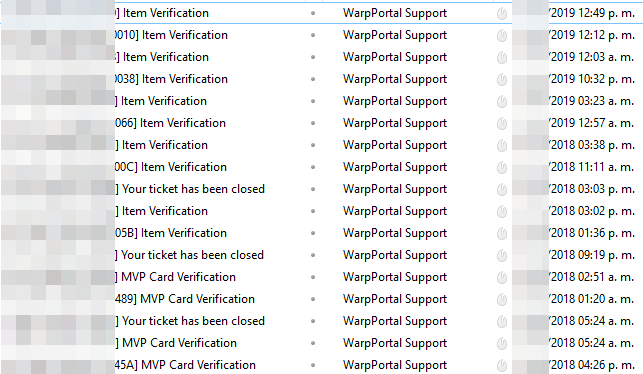 Also, the fact that we have to send in a ticket to get everything verified is a pretty stupid concept for any game company. Yes, we are still looking into that ticket with the user in question. We cannot really discuss the detail here as things are handled on case by case basis. I am with you though, the players should not be obliged to ticket every transaction, this is too much.. The least we could ask, be transparent and forward with the process, for example by emailing the account owner with a summery of the purge performed on a given item. Not the other way around. With that all said, if anyone else is having an issue with their verified item or purge process to PM Familiar on forums with the ticket numbers. They will be able to assist within 2 working days on average. Personally I'm not affected by this. But is there a solution in the works for this or any future plans? ...In the works, yes MikeWolf. Funny... I thought of posting something like that yesterday. Was thinking how messed up it would be if all those verification turned out to be pointless with a case like that. Welp, it clearly means they’re either sloppy about it or don’t really know what is and what is not duped. Pretty sad. Edited by Ilindith, 14 February 2019 - 12:11 PM. I'm curious, if certain items, let's say temporal rings, were mass duped then removed by GM's wouldn't the market then raise the prices on the legit one because people are in a rush to replace their deleted ones?Is that fair? Edited by hammie, 14 February 2019 - 11:01 AM. I dont think removal of zeny/items from affected accounts is anything close to as bad as blatantly banning/locking accounts. It seems the latter doesnt happen very often nowadays but, sometimes they still do it. I'm rather curious when and why the extreme account suspension happens, or it is just random that can happen to any unlucky ppls. it comes down to courtesy of the GM team. if you're going to tell us that our items are duped and then remove them, kindly send an email so we have a chance to dispute it and/or talk about compensation. don't just remove a f'n item from our accounts without telling us about it. you put a dent in our day/plans/whatever when we go looking for an item and can't find it and then have to waste our time emailing you about it. it's simple courtesy. we spent time/effort to acquire X item and it's not our fault if the item we are trying to buy happens to be duped. if its duped? fine. remove it and compensate us. but show some f'n class as businessman because it's ridiculous the way you handle yourselves and this gaming business concerning the duping. obviously its a major issue that kills player motivation. so instead of thinking only about money and how to keep the game alive, how about paying more attention to the smaller connecting details that hold together your gaming community? because quite frankly, we are your survival. you don't exist without our wallets. remember this, GMs. I dealt with some very nice gms recently who did their job extremely well. So hopefully the standard across the board will get better. that was exactly what happened to someone i know, he got his mvp card way back and had screenshot too. then one day gm jst removed it and said its illegal, he got zenies compensation because he proved it was a legit item. GM teams dont know about verifying, [Kittens]. Edited by VModCinnamon, 14 February 2019 - 01:45 PM. When my item was deleted I didn't get notified but I was compensated within maybe 4 hours. I didn't provide any screenshots. I was also polite to then so not sure if that matters haha. Some notification would be nice though. Again, having an item removed/purged is nowhere near as bad as having your account banned/suspended. I guess it just happens that some GMs are good and competent, some GMs are newbies and incompetent. Perhaps they need to invest some OCP revenues to fund the training of newbie GMs, I've dealt with very good and friendly GMs but unfortunately not all of them are up to this standard. Edited by LordYggdrasill, 14 February 2019 - 12:43 PM. Yeah I'm sure if my account was suspended or banned my tone would have been a little different especially if they weren't responding. Notifying people is definitively something that needs to be done. maybe VmodCinnamon be GM team?